Open from the 3rd April 2019 until 27th September 2019 on Wednesdays, Fridays and the first and third Saturdays and Sundays of the month from 1:00pm to 5:00pm. See the calendar below for the days we are open. We have a series of events and workshops throughout the summer. 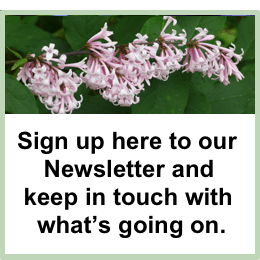 To keep up to date with what’s happening in the garden, please sign up to our newsletter. Entrance to the nursery section is free. A single visit to our beautiful gardens is £5 or £1 for children aged 5-16. An annual Season Ticket, allowing unlimited entry (during normal opening times), is just £15. The garden is free to RHS members on Wednesdays and Fridays in April, May and September. Sadly we are unable to accept the RHS card on weekends or in June, July and August. Advance Family Ticket for £10. Save over 16% on family entry for two adults and two children (5 to 16) on Sunday 23rd June 2019. Tickets ordered online will be sent by post. We are delighted that we can now accept card payments over £10, for entrance to the garden and buying plants. Please note we can only accept cash for payment in the cafe. The gardens and nursery are open to booked visits of 15 people or more. Find out more about group visits. The gardens are also open to private hire. We have ample on site private parking. There is also a bike rack for cyclists. Homemade cakes and refreshing teas within our courtyard are a must for every visitor. The Tea Room in our lovely renovated barn is a place to sit with your coffee, admire the art exhibitions, flick through magazines and gardening books and shelter if it is raining! We also have picnic tables available for your convenience in the grass car park. If you would like to have your lunch locally we would suggest either York Marina in Naburn or The Fat Abbot at Escrick. There is a small playground for younger children. Dogs are welcome in the grass car park but not in the gardens. Guide Dogs are of course welcome in all areas.